There are too many different little problems that require attention- it doesn't just work and it's not reliable for regular use. My van has several small "bugs" that I have dealt with since I bought it. The headlights and tail lights frequently need to be changed. It takes a minimum of 3 tries to start every time. The engine is placed in such a way that "simple" repairs, like replacing a spark plug on cylinder 1 require that the entire engine be unmounted and shifted to gain enough room to reach that one cylinder head. I bought it used, but the quirks and kinks that I go through to keep it running make me wish I hadn't bought it at all. My husband and I love this car because it is easy to get in and out. We have plenty enough room over head and around. Also one of our kids can fit in the seat with one built in booster seat which can be folded up, so it is an extra. It is a good van for a small family to go here and there. We have gone for family trips cross country many with this van and have no problem. My vehicle overheats when it goes highways speeds. I currently own a Chevy Venture. I would not recommend this vehicle because I have experienced great trouble with it overheating. After thorough research, a mechanic gave me bad news that my head gasket was leaking. The entire dashboard relay is has a complete wiring problem as well. None of the gauges work. 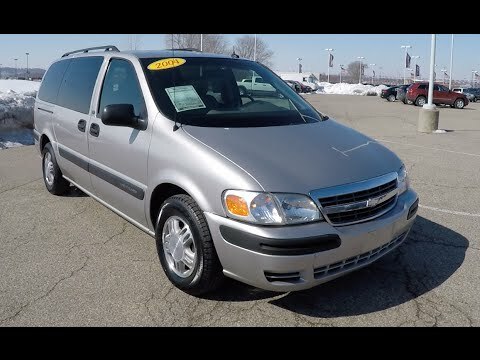 2003 Chevrolet Venture LT, Extended, Leather Quads, DVD player, NEW GOOD YEARS!!! CERTAIN MINIVANS FAIL TO CONFORM TO THE REQUIREMENTS OF FEDERAL MOTOR VEHICLE SAFETY STANDARD NO. 213, CHILD RESTRAINT SYSTEMS. THESE VEHICLES DO NOT HAVE TEXT AND FORMATTING ON THE WARNING LABEL ATTACHED TO THE AVAILABLE SECOND-ROW INTEGRAL CHILD RESTRAINT AS SPECIFIED BY AMENDMENTS TO THE STANDARD. IF A PASSENGER USES THE INTERIOR HANDLE TO OPEN THE POWER SLIDING DOOR AND HOLDS ONTO THE HANDLE WHILE IT IS BEING OPENED BY THE MOTOR, THE PASSENGER'S ARM MAY BE PUSHED INTO THE SEAT BACK OR ARMREST AND A WRIST OR LOWER ARM INJURY MAY RESULT. DEALERS WILL REPLACE THE POWER SLIDING DOOR INTERIOR HANDLE ON THE PASSENGER-SIDE. IF THE VEHICLE IS EQUIPPED WITH A POWER OR MANUAL SLIDING DOOR ON THE DRIVER-SIDE, THE INTERIOR HANDLE WILL ALSO BE REPLACED FOR APPEARANCE REASONS. NOTE: BEFORE THE VEHICLE IS SERVICED, GM ADVISES OWNERS TO NOT USE THE INTERIOR DOOR HANDLE TO OPEN THE DOOR. THE DRIVER CAN OPEN AND CLOSE THE DOOR FROM SWITCHES AT THE DRIVER'S POSITION OR BY USING THE REMOTE KEY FOB. THE DRIVER SHOULD TELL PASSENGERS TO USE THE SWITCH LOCATED IN FRONT OF THE DOOR TO OPEN OR CLOSE IT. THE DRIVER SHOULD USE THE OVERRIDE SWITCH TO PREVENT OPERATION OF THE POWER DOOR BY CHILDREN OR BY OTHERS WHO ARE NOT FAMILIAR WITH ITS USE. THE RECALL IS EXPECTED TO BEGIN IN MARCH 2005. OWNERS SHOULD CONTACT CHEVROLET AT 1-800-630-2438; PONTIAC AT 1-800-620-7668; OR OLDSMOBILE AT 1-800-630-6537.